Washington opened the scoring with WR Terrelle Pryor catching a long pass in the endzone over CB Marcus Peters. After they followed that up with a field goal, Kansas City would get a touchdown of their own, as TE Travis Kelce scored with less than 2 minutes left in the first half. The second half would see multiple lead changes and seemingly the game was headed to overtime when Washington made the game tying field goal with less than 50 seconds left. However, QB Alex Smith engineered a game winning drive in regulation that ended with a Harrison Butker field goal. Eventually the Chiefs would walk away with the 29-20 victory. With that, we give you our PFF exclusive takeaways from the contest for each team. 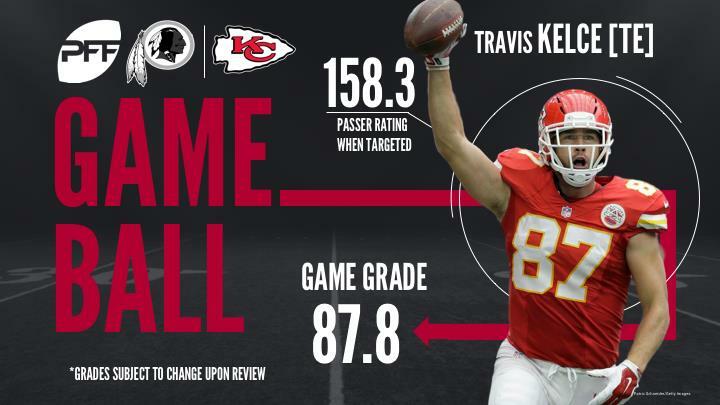 Kelce showed up in a big way Monday night, catching 7-of-8 targets for 111 yards. He was a matchup issue all night for the Redskins, as they tried having CB Kendall Fuller covering him and he caught a seam route for 32 yards. He also presented a mismatch for the Washington linebackers because of his route running ability, hauling in all four targets against them for 52 yards. His yards per route run mark of 3.06 leads tight ends for the week. Smith’s late fourth quarter throw to WR Albert Wilson that put that Chiefs near field goal range capped off an already solid performance. Being under pressure on 21 of his 45 dropbacks, Smith often had to get the ball out early and 29 of his attempts were thrown under 2.5 seconds. He made the Redskins pay when they brought the blitz, as he completed 6-of-7 attempts when they brought extra rushers for 91 yards with a passer rating of 158.3. Early on it seemed like Mitchell might be in for a long night, as the Redskins seemed to target him early in the game. But in the end he allowed just two receptions on five targets for 19 yards, with just 2 of those yards coming after the catch. Mitchell had generally tight coverage all night, and made a great play by breaking on a pass and smashing into Jordan Reed at the catch point, causing the ball to fall incomplete. Zombo didn’t have great success rushing the passer, recording just one quarterback hit and one quarterback hurry in 21 pass-rushes. However, he was fantastic with his run defense, recording four solo stops and constantly disrupting the run game. Zombo finished with an 82.9 run-defense grade, second on his team only to Chris Jones’ 85.1 run-defense grade. It was a slow start for Cousins, even with the success of the opening drive. He under-threw the touchdown to Terrelle Pryor, and was lucky that Pryor was able to get away with that slight push to prevent the throw from being defensed. But after that Cousins was fantastic. He looked deep (20-plus yards in air) five times and completed three of them for 133 yards and the touchdown. And he should have got a completion and touchdown on a perfectly thrown strike to Josh Doctson late in the game as well. Perhaps most impressively, Cousins had a perfect passer rating of 158.3 when he was faced with a blitz. Even at the age of 33, Davis is still a tough cover for any linebacker. He proved that when the Chiefs inexplicably asked Justin Houston to cover him one-on-one, which predictably ended with a massive gain of 69 yards. But Davis added another catch for 20 yards as well and was actually solid when run blocking, something he has struggled with in the past. Davis finished with an impressive 85.6 run-blocking grade. The third-year cornerback was called into duty as the injuries piled up in the secondary. He performed admirably with a coverage grade of 86.3, he was targeted five times, only surrendering three catches for 14 yards. Dunbar will likely be tasked with more playing time in the coming weeks, as it was reported in game that CB Josh Norman could miss time. Ioannidis led the Redskins defense with 6 pressures on a night where they accumulated many against Kansas City. That gives Ioannidis 15 total pressures in his last three games. Ioannidis ended the game with a pass-rush productivity (PRP) of 17.0, which puts him among the elite at his defensive end position and only behind Aaron Donald’s 19.9 this week.